Brine ingredients: non-iodized salt, sugar, darker sugar, garlic powder. Fish, properly vacuum sealed and frozen, thawed slowly over a 24 hour period in the refrigerator. 50% of the brine formula: 7 parts salt and 1 part garlic powder. Rinse filets well and dry thoroughly. For collars (pectoral fin area) trim the fin so they fit better in the brine and smoker. Skin the inner layer membrane off the collars. You’ll need a sharp knife and some knowledge of skinning a fish. Removed membrane (left) and the readied collar (right). Discard the membrane. Thoroughly cover the fish with the dry brine. Leave thicker filets in for roughly 2.5 to 3 hours. The collars come out after 1.5 to 2 hours. You’ll have to experiment a little to suit your taste. The thicker the pieces the longer you brine. Also, different species of salmon have different rates of uptake of salt. 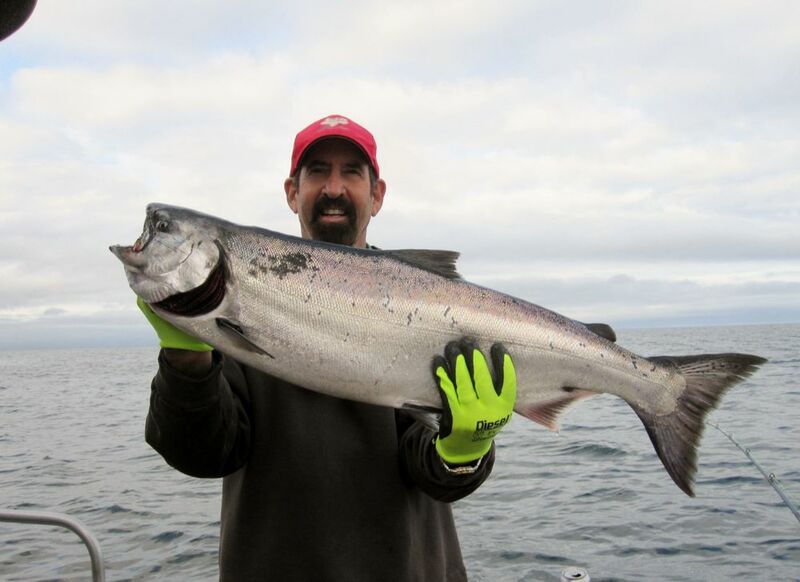 Coho should be brined less time than equal size pieces of king salmon. Metal pan readied with paper towel liner to receive fish after brining and rinsing. Thoroughly rinse brine off under cold water. Pat the fish dry with a paper towel. Allow to sit at room temperature for at least an hour, preferably closer to two hours. As the fish sits at room temperature it should form a glossy sheen. With fresh caught fish, this is pretty obvious. With previously frozen fish, less obvious. We use a Luhr Jensen Big Chief smoker. They are inexpensive, last forever, and do as good a job (in my opinion) as any of the more sophisticated and expensive smokers I’ve owned. The wood chips come from Luhr Jensen and I’m unable to taste a different between types of wood used in the chips. Cherry, apple, mesquite – it all comes out as smoke to my unsophisticated pallet. I do use the insulating jacket if it’s cold out. On warm summer days, it’s not needed. My smoker’s hottest shelf is on the bottom. Next hottest is on the top. I put the thickest pieces on the bottom, next thickest on top, then scatter smller pieces in the middle shelves. The fish is done when it’s a nice darker brown as pictured. Nearly finished coming out of the smoker. Heat honey in the microwave until it’s watery then paint an ultra-thin layer onto the fish. This gives a nice glazed finish and a hint of sweetness. Store the finished product in the refrigerator but DO NOT cover it or bag it in plastic. The fish needs to breath and set up in open air. It will get better and better the longer it sits – within reason. I like the collars after at least a week in the refrigerator uncovered. Before serving, place the fish on a dish and let it come to room temperature. It will have more flavor that way. I store mine on a dish at room temperature for days and it only seems to get better. Again, not covered, not wrapped – open air and allowed to breathe. I learned this from Ray Vodapesp of Seattle who fishes off our dock with friends each summer. He specializes in smoking salmon, especially the very oily belly strips and tips (the pectoral fin area), but it works with fillets, too. Ray spends a lot of time in Sitka each summer and when a fresh batch of his fish comes out of the smoker, all work on our dock grinds to a halt and the eating begins. Mix equal parts of salt, garlic salt, sugar, and brown sugar in a large plastic tub. I use a pound of each ingredient to make a large batch of brine. Make sure you mix it all thoroughly and evenly. Next, take your fish, rinse it well, and put a layer, skin down, in a plastic container (never use metal). Cover that layer completely with brine, then add another layer of fish and cover it completely. The flesh side of the fish (facing up) should be caked with brine in you large Tupperware type container – as many layers as the container will hold. Brine bellies and tips for about three hours, and thicker filets for four hours. Then take the fish out, rinse it thoroughly under the tap so no brine remains. Next, pat dry the fish with a paper towel; put it on a pan, skin side down, with paper towels under. Let the fish sit in open air for one to two hours then put it in the smoker. I use a simple and relatively inexpensive Luhr Jensen “Little Chief” or “Big Chief”. I’ve experimented with more exotic and expensive units, but always come back to the chiefs. If it’s really cold or windy out, you can wrap the smoker in insulation sold by Luhr Jensen as an option. I don’t put insulation on my smoker unless it’s below 25 degrees outside and windy. Slow heat is better. It takes anywhere from 6 to 12 hours to finish the fish depending on the size of the load and the outside temperature. I’ve use the Luhr Jensen wood chips and make sure there is pretty constant smoke during the first three or four hours, after that, I add smoke chips every couple of hours. The fish may finish at different times. The lowest shelf on the smoker is closest to the heat source, so I put the thickest pieces there. They often finish first. Check for a deep almost mahogany color and press on the fish to make sure it has cooked through. As always, don’t overcook your salmon. This really isn’t a problem with bellies and tips which have so much oil they are hard to dry out. With filets, you want to barely cook through – just a wee bit of rouge in the middle, slightly darker than the look of cooked salmon, is ideal. After you take the fish out, while it’s still warm, take some microwaved honey (to make it watery thin) in a bowl and paint a faint layer over your fish. The end result is habit forming. Final note – never store smoked fish in plastic bags or plastic containers – it ruins it. The fish must breath. Store it on an uncovered plate in the refrigerator. In the open air of a frost free refrigerator, your smoked fish will set up nicely. The longer it sits in the refrigerator, the better it gets, and lasts forever. Smoked fish will taste best if you let it sit at room temperature for at least two hours before serving. The Freshest Fish You’ll Ever Eat! 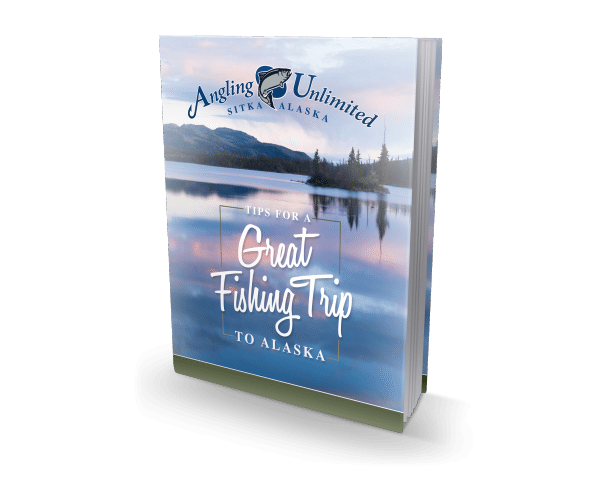 Come join us in Sitka, Alaska for Angling Unlimited’s annual Hook It & Cook It. It’s 4 days of catching world-class Alaskan Salmon & Halibut, followed each evening by a dinner at our lodge where the daily catch is cooked right in front of you by our private Chef Ludger of Szmania’s restaurant in Seattle. Prepare Your Fish The Right Way! Fresh, wild fish is a nutrient-rich and healthful food source. Wouldn’t you want to properly prepare it? Every week we share a recipe on our blog featuring the delicious fish we catch in the North Pacific including salmon, halibut, rockfish, cod, and shark. Enjoy! If you buy a new Chief smoker, open the box from the bottom and save the box for an insulator. You’ll have to cut a smoke hole and a door hole. Make the top hole large enough to be able to grab the handle if you have to move the whole works. For a Little Chief, two bricks and a piece of linoleum under them make a nice clean way to insulate the smoker from whatever you set it on. What temp do set your smoker at?